A high AVSAB score will improve your chances of getting the specialty/job and signing bonus you want. Start studying now by taking ASVAB practice tests. These tests will give you an idea of how you'll score, and identify areas that need improvement. 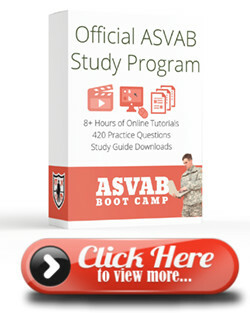 Many find it helpful to also study ASVAB online course tutorials on sections of the ASVAB test. Or, you can get a complete study package that includes practice tests, online classes and study sheets. It's important to get the highest score possible on the four primary sections of the test. The higher scores in Arithmetic Reasoning, Word Knowledge, Paragraph Comprehension and Mathematics Knowledge will qualify for very desirable job positions in the military. Here is a link for minimum ASVAB score requirements for each branch of the military. Measures ability to solve arithmetic word problems. Measures ability to select correct word meanings presented in context and to identify synonym for a given word. Measures the ability to obtain information from a written passage. Measures knowledge of general mathematics principles, including algebra and geometry. Measures knowledge of physical and biological sciences. Measures knowledge of electricity, radio principles and electronics. Measures knowledge of tools, shop terminology and practices. Measures knowledge of mechanical and physical principles and ability to visualize how illustrated objects work. Measure spacial skill and ability to identify relationships between objects. Measures knowledge of automobiles, tools, shop terminology and practices.